How can we calculate meteorological drought indices? The deciles index (DI) was defined by Gibbs and Maher (1967). For calculating this index, we should to sort the precipitation data in a specific format. In this approach proposed by Gibbs and Maher the total monthly precipitations from a long record is first ranked from highest to lowest to construct a cumulative frequency distribution. The severity of drought can be assessed by comparing the quantity of rainfall in a particular month or several months duration with the long time cumulative distribution of rainfall values for that time. The PN index for a speciﬁc location was described by Willeke et al. (1994) as percent of normal precipitation. The PNI index is simple, by definition, easy to calculate, and is easy understood by a general audience (Smakhtin and Hughes 2004). The index can be calculated for a variety of time scales. The RAI was developed by van Rooy (1965), and incorporates a ranking procedure to assign magnitudes to positive and negative anomalies, namely it considers two phases, positive precipitation anomalies and negative precipitation anomalies. Refer to van Rooy (1965) for details of calculations. The CZI is based on the Wilson–Hilferty cube-root transformation. In the calculating of CZI, we assuming that precipitation data follow the Pearson Type III distribution. To calculate the MCZI, the median of precipitation is used instead of the mean of precipitation in the calculation of the CZI. The ZSI is more analogous to CZI, but without the requirement for fitting precipitation data to either Gamma or Pearson Type III distributions. The more the value of this index, the more severe the drought. For calculating of ZSI, we use mean monthly precipitation and standard deviation of precipitation in a specific month. -	How can we use RDIT software? For calculating rain-based meteorological drought indices we need a useful software application that it can apply for calculating this indices. To use the RDIT application the user can follow this steps. At the main screen of RDIT, you can see three tabs (Fig. 1). First tab is “Data”. 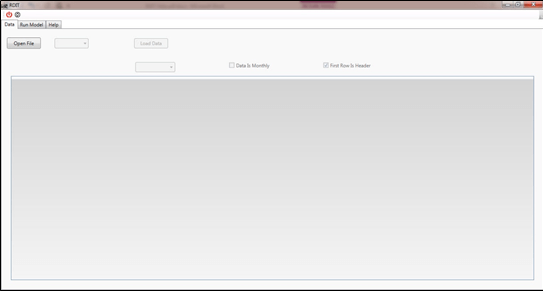 In this tab user can browse the input file of data. 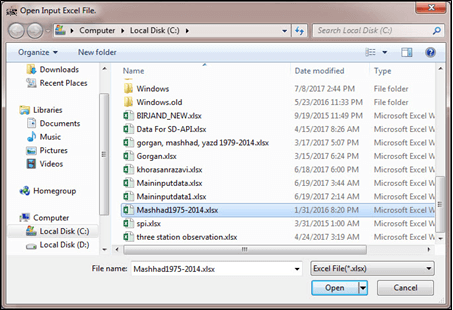 By clicking on the “Open file”, the user can select input file (Fig. 2) with Excel format file. 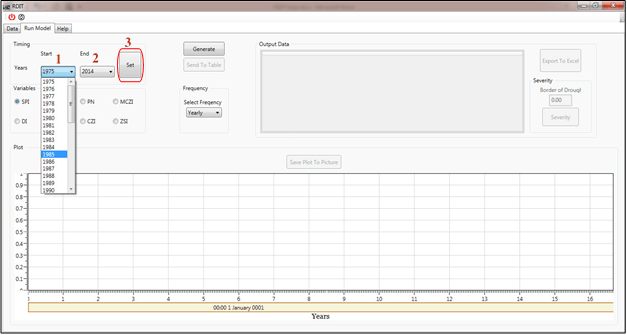 The input file can be in different time scale, namely daily, and monthly. 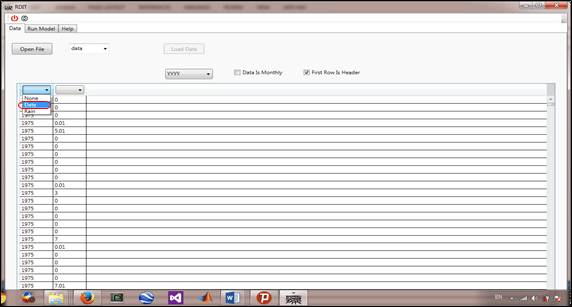 When the user browse the input file, the sheets of the file is appear in the first menu (Fig. 3). According to Fig. 3, the selected file has two sheets: data and sheet1. The user can select every sheet that he/she wants. By selecting the desirable sheet, you can observe the data of input file. Now, in this step, some assignment should be apply. According to Fig. 4, the format of data should be select. In this example the format of “YYYY” has been selected (Num. 1, in Fig. 4). 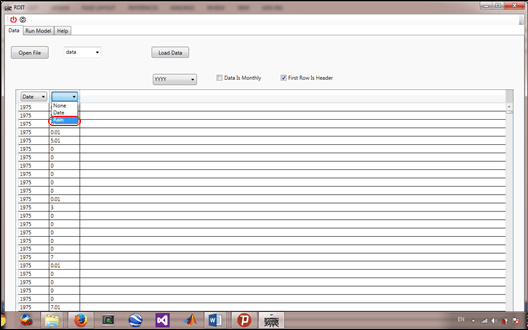 Then, if the input data is in monthly format, please select the checkbox of “Data is Monthly” (Num. 2, in Fig. 4). 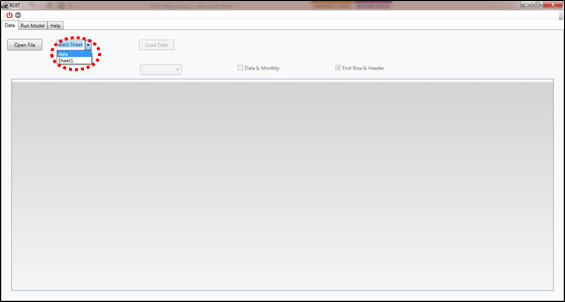 Then, if the first row of input file has header, sign the checkbox of “First Row Is Header” (Num. 3, in Fig. 4). 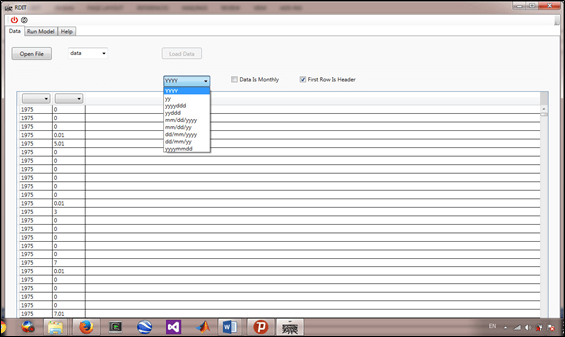 In this phase, the user can select the type of columns. In this example, the first column is Date and the second is Rain (Fig. 5 and Fig. 6). May be the input file has different columns, note to select the appropriate value (Rain) among all variables. 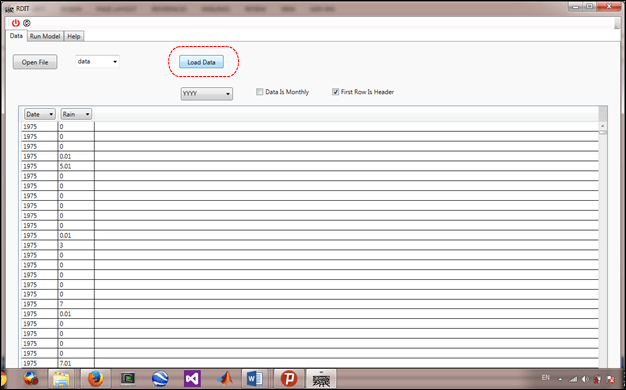 After all assignments have done, then the user can click on “Load Data”, and go to second tab (Fig. 7). While the input data is loaded then the user can start the model for calculating the indices. As we mentioned before, RDIT can run eight rain-based meteorological drought indices. Fig. 8 show all the indices, start, and end of years. As an example we select “SPI” (Fig. 8). After selecting the intend index, the process for perform the index can be start. When the index is selected then the period of study should be indicate. The input file start from 1975 to 2014, the user can change the start or end year according to the range of input data file (1975-2014). 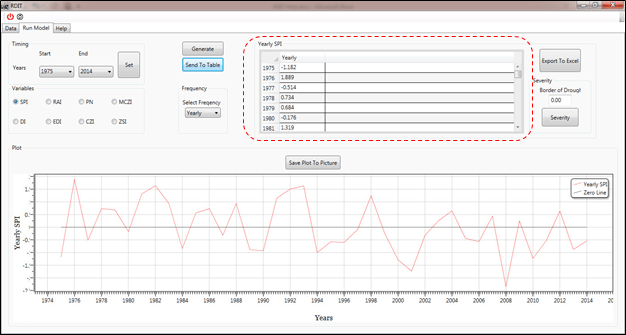 For example in this case, the user can select 1990 for the start year and 2010 for end year (Fig. 9 Num. 1 and 2). After select the aim period, click the “Set” button (Fig. 9 Num. 3). After, the data has been set, then, the frequency of index should be specify. 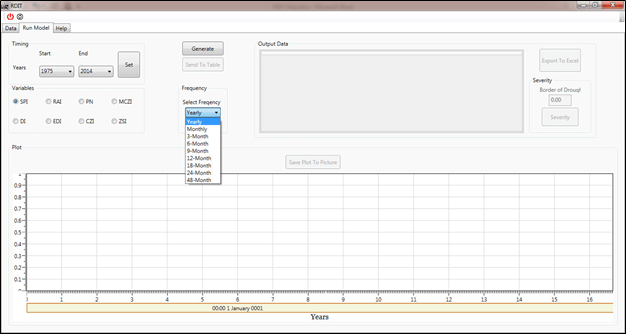 In the “Frequency” panel, the user can select the desirable time scale. 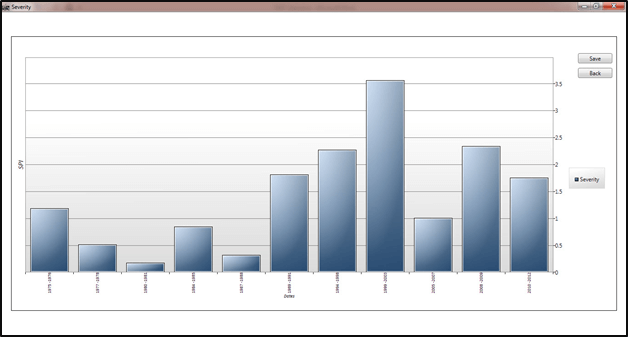 In this example, we select “Yearly” scale (Fig. 10). After all the options has been filled and selected completely, then the user can click on the “Generate” button (Fig. 11), and the graph of SPI during the specified years can be observe in the bottom of the page. 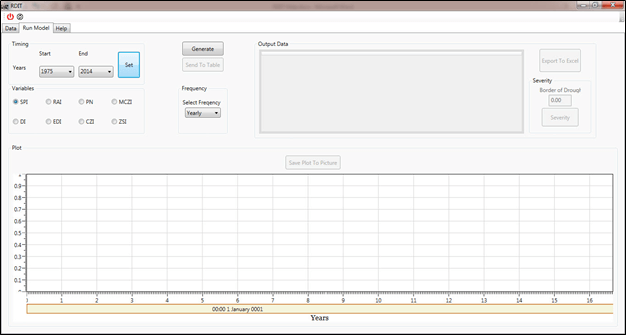 The user can easily save the graph in any format of picture data (such as .jpg, .tiff, .png, and etc.). By clicking on the “Send To Table” (Figure 12), the value of SPI can appear in the right table in Fig. 11. By select the “Export To Excel” button, the value of SPI’s table can export in an Excel format file. By clicking on the “Send To Table” (Figure 13), the value of SPI can appear in the right table in Fig. 13, Num. 1. By select the “Export To Excel” button (Fig. 13, Num. 2), the value of SPI’s table can export in an Excel format file. The last important things in this screen is the “Severity” concept. In “Severity” panel, the user can fill the “Threshold Of Drought”. The threshold of drought index is a value that an index faces to drought condition. In every index this value can be change. For example, in many indices the threshold of drought start from zero or less zero. In other words, when the value of an index is calculating then the all the values that located in the drought classes, refer to severity of drought. 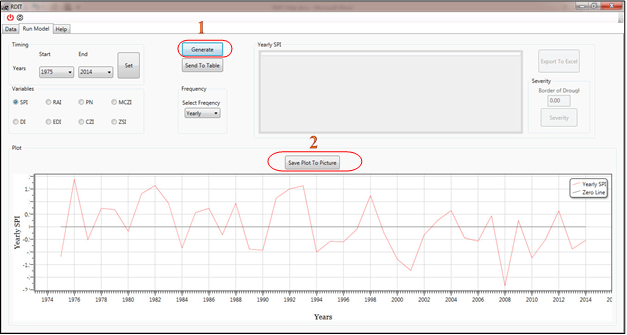 With assign the threshold of drought in SPI to zero in this example, then by clicking the “Severity” button (Fig. 12, Num. 3) the values of severity can be plot (Fig. 13) and this plot can easily save in all format of picture file. In the last tab, you can view the “Help” of RDIT software package. For better understanding view the movie help file. In this movie you can follow all the steps one by one. The user can easily watch the help movie and follow the steps to calculate rain-based meteorological drought indices.